Apple eyes on the Chinese market – Digital marketing with Christy! 2015 first quarter’s iPhone sales in China surpassed the US market for the first time, China seems to be the largest market in the global iPhone arena. Moreover, for the first time ever Apple becomes the leading mobile supplier in China. Continued with the passion in Apple, Apple Watch recently made good performance of sales in the Chinese market with more than 200 million units sold. The Chinese huge enthusiasm for Apple products, hence draw Apple’s attention on the market. Taking Chinese consumer’s little fancy, Apple then has come up a few strategies for the local market. Not long ago, Apple declared there will be at least 20 more stores operated in the Chinese market in 2016, in order to meet the growing consumer demand. The next step, Apple appeals to the Chinese luxury demand by rising the price. In that sense, Apple offers super ‘premium’ products with premium price exclusively for Chinese consumer. One of the reasons Chinese market is relatively difficult to blend in is that the country has been isolated from the rest of the world. No matter the business regulation or social network, communication method has been distinguished. In regards to the social media platform, Facebook, Twitter and Youtube such channels which connect to the international arena are forbidden. Instead, China developed its own network – Weibo, Wechat, Ranran and so forth to replace all. Hence, the way marketing on the international market does not simply work on the Chinese market. Businesses will have to localize service to favor target consumer. In this case, Facebook and Twitter apparently are not the options for Apple to crack on the Chinese market. In order to intensify the market share, Apple then has given particular focus on the localisation of service for Chinese consumer, in particularly focusing on social media platform. Has anyone noticed the new Apple Watch has a build-in app called Wechat? This social network is considered the Chinese version of Wtaspp and a bit of mixed Twitter which is much favored by the Chinese. Apple had always given Chinese users an unpleasant impression. While many users decided to adopt Apple’s products, but few ways to be expressed ideas or directly talk with Apple’s executives. 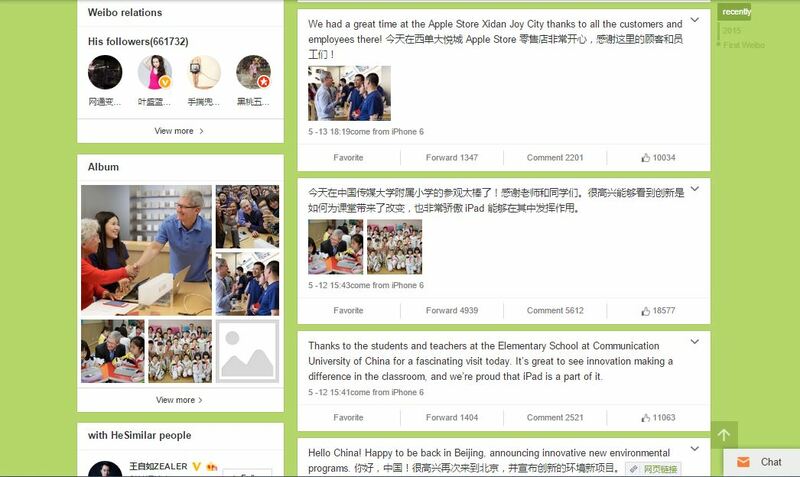 In early May, the Apple’s CEO Cook started his first post the Chinese microblog – Weibo (unfortunately you will need a Weibo account to view others’ profile). It is noticeable that and hope to have more opportunities to communicate with China’s apple users. Apparently Apple’s localized strategy has been successful with enthusiastic feedback from Chinese users. Tim Cook has now more than 6 m followers! On his Twitter account, he has 1, 17 million of followers. With China’s growing market, Apple is bound to put various measures in the future to strengthen exchanges and communication with the Apple users. Previous The Yellow Pages came back! In terms of hardware and software, I think Apple really has potential to keep the percentage of sales in China. In fact, what is important is the idea to follow to the change of Chinese people. Considered how the competitor Android are giving more flexible options, Apple has to be aware and to keep it up to avoid consumers turn to Android phones and give up apple products. Hey Wil, thanks for the comment! I agree! Apple definitely has to keep doing sth in China in order to maintain the market share. Not only Andriod, the Chinese national brand Xiaomi has been one of the major competitors too. Apple still has a long way to remain in that winning position. Apple is doing the right thing, Chinese market is really a huge market for now. I can see lots of Asians in luxury stores, as well as Apple store. Apple will gain more revenue if they keep on eyes with Chinese market. Actually there are many wealthy people are living in China and the number is growing, I would say most of them have created their own business, like selling cars, rolling money though investing money on properties and stock market, thus, the needs of luxury things will be increased. the CEO of Apple has a good start for entering the Chinese market. 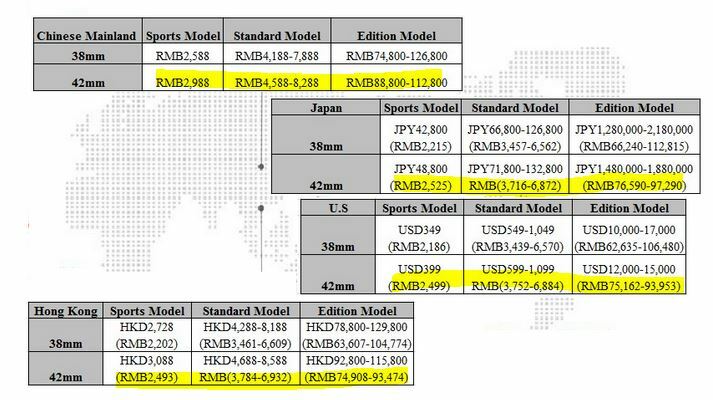 They can also break the rules when launching the new models, not held in US anymore, maybe the press conference can be held in China later on in order to draw people attention! I agree. As the market is still growing in China, I believe there will be much potential to be found there.